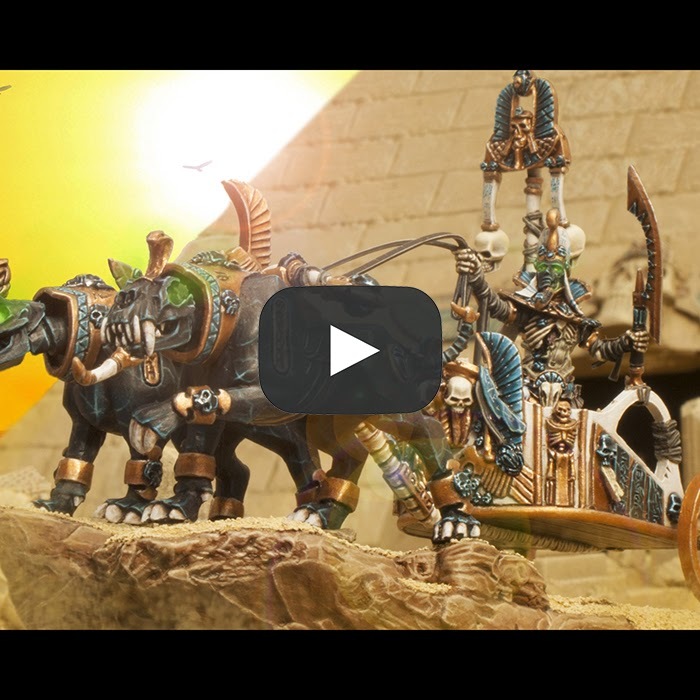 Today I have my video for my Tomb King on chariot, King Pharakh the Vain. I have been working on this video in bits and pieces since I finished painting the model. I have upped the production values and effort going into this. I hope you enjoyed it, it was certainly a lot of fun to make. I think the one thing that really helps elevate it above all of the other videos I have made is the music, which was provided by professional composer Adam Harvey (Ultramarines, The Lord Inquisitor) again. I really want to thank him, since not only did he provide the song, but he created it specifically for me and this video! As you may know, I have used some of his music for my past two videos. These were songs he had already created that he graciously let me use. When I was working on this video I asked him if he had anything that sounded like it would fit a Fantasy setting, but darker then the one I had used for Valten. I also mentioned that if it sounded somewhat Egyptian then that would be great. After looking through his back catalog he informed me that he didn't have anything like that, but offered to make something brand new for me. After pointing him in the direction of the soundtrack from the 1999 The Mummy, he came back to me with the finished piece you heard in the video. To say I am blown away by the song is an understatement. It's fantastic and is more then I could have hoped for. I have a feeling I may listen to this song a bit while I am painting future models for my Tomb Kings. You can follow him on his Facebook page and listen to some more of his music on his Youtube channel. The big challenge for me making this was the opening title sequence. I have to thank Erasmus Brosdau for helping me figure out how to do the sand title with my limited programs and experience. This is also my first video where I got to use my new motorized turn table to give everyone a 360 degree view of the model. The video was a lot of fun to make and I hope to keep improving what I can do with my videos for each new one. If you have any questions just let me know in the comments below. I will be going over how I made some of the more elaborate photos used in the video in a future post.